With hot water heater plumbing pipes and gas lines or electric wires, hot water heaters seem complicated, but try some hot water heater troubleshooting before calling a plumber or electrician. the gas control knob and detach both ends of both the thermocouple and pilot supply line. Buy a same-length replacement, reinstall the thermocouple, turn the gas on and relight the pilot on the hot water heater. If you still aren’t getting any hot water from your heater, or if the pilot light is more yellow than blue, clean the burner. Turn off the gas and remove the thermocouple and pilot supply line. Also remove the burner tube and unclip the burner unit. It should look like a metal plate with a clamp on the bottom. Unscrew the burner and clean the pilot gas tube with a small wire brush or wire. Shake any debris off the burner plate and vacuum the gas tube on the hot water heater. Reassemble the unit, turn on the gas and light the pilot. If your hot water heater troubleshooting didn't solve the problem, it’s time to call a professional. If you aren’t getting any hot water from an electric hot water heater, hit the reset button and wait for a click. If that fails, reset the electric breaker. The next step is to test and possibly replace the thermostat or heating element on the hot water heater. the end of the element. Loosen and unscrew each element, then have an appliance parts dealer test the part on the hot water heater. Replace a broken element on the water heater. If the element is fine, the thermostat might be broken on the water heater. The next step in hot water heater troubleshooting is to disconnect and mark the thermostat wires, then have the thermostat tested. Replace if necessary. If the unit is set on high, but the water is not hot enough, try draining the tank and removing crusted minerals from the anode. Shut off the water and the power supply. Then attach a hose to the drain valve and drain the tank. Look for a one-inch nut on the top of the heater. Loosen the nut and pull out the anode rod. If it is covered in mineral deposits, replace the rod. Refill the tank, then turn on the power supply. To prolong the life of the water heater, drain and refill the tank once a year if you have hard, mineral-laden water. Try some hot water heater troubleshooting before calling in a professional. But also know when to throw in the towel. For example, if the hot water heater leaks, the tank is probably rusted through and should be be replaced. Types of Water Heaters Fuel type, availability and cost. The fuel type or energy source you use for water heating will not only affect the water heater's annual operation costs but also its size and energy efficiency. See below for more on selecting fuel types. Size. Before you purchase a water heater, it's also a good idea to estimate its annual operating costs and compare those costs with other less or more energy-efficient models. 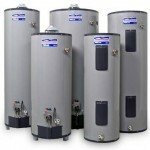 Visit the pages on different types of water heaters (linked above) for more on estimating costs. Available throughout the United States to those who will have or already have a geothermal heat pump system installed in their homes for space heating and cooling. See Heat Pump Water Heaters for more information. current fuel costs or rates. conventional storage water heater, even though local natural gas costs might be lower than the electricity rates. Top quality at economical prices guaranteed! energy efficient hot water heater. most dangerous appliance in your home? ceilings and foundations, and can create nagging mold problems. Water heater manufacturers recommend flushing sediment from your storage type water heater periodically. high mineral content will have to flush more often. and pets away during the procedure. water company flushes out their lines. will probably burn out quite rapidly. inlet valve back on to “power flush” the sediment out. a long screw driver to break up the clog. This is a very messy procedure. When the garden hose runs clear you are finished. Turn the heater back on, and with gas units re-light the pilot light if necessary. Prairie, Beloit, Darien, Delavan, Walworth, Brodhead, Clinton, Footville, Orfordville, Whitewater and more.